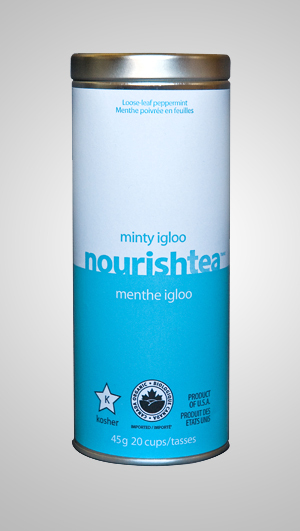 nourishtea’s minty igloo is grown in Oregon, USA. It’s an authentic, unblended (certified organic) peppermint. Our packaging says the following of minty igloo: “nothing beats a warm cup of peppermint to calm your nerves at the end of the day or settle your stomach at the end of a great meal”. We really jumped the gun on this one…. we had no idea how minty fresh this peppermint really was when we wrote this copy! minty igloo is like FIRST KISS fresh. It’s “see your breath” minty fresh. You’ll love it as much as we do. Steep for three minutes, add perhaps a small tea spoon of organic cane sugar (at most)… and sit back as we blow your minty mind.